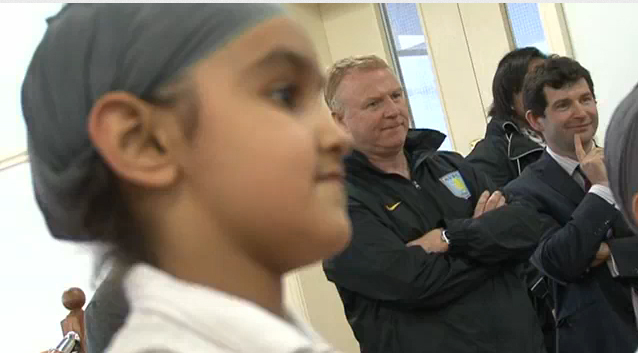 Aston Villa football club celebrated being awarded the Advanced Level of the Equality Standard by Kick It Out at Birmingham’s Nishkam Centre as part of their proactive, conscientious effort to engage with all groups and communities across the city of Birmingham and spread the message that Aston Villa is a place for everyone. The tremendous achievement made the team the second club in all football with the Advanced Level. It also served as a great occasion to visit their friends at the Nishkam Centre and celebrate their achievement with an equal multicultural and interfaith ambassador that works with organisations and faiths groups towards uniting individuals and communities across the country. The visit to the Nishkam Centre included a tour of various areas of both the faith and civic arm of the Guru Nanak Nishkam Sewak Jatha and a visit to theNishkamPrimaryFreeSchoolwith a kick about with the children, all keen to see the stars. The team expressed their thoughts on the desire to learn about the diverse cultures that make upBirminghamand spreading the message about the Sikh community too. The Equality Standard for Professional Football Clubs has been developed by Kick It Out to replace the Racial Equality Standard introduced in2004. could participate without fear of discrimination.